Valentine’s Day is around the corner. If you’re skipping dinner reservations this year, treat your significant other to this special Beef Wellington dish! There is no better way to show your love then with a delicious meal straight from the heart. 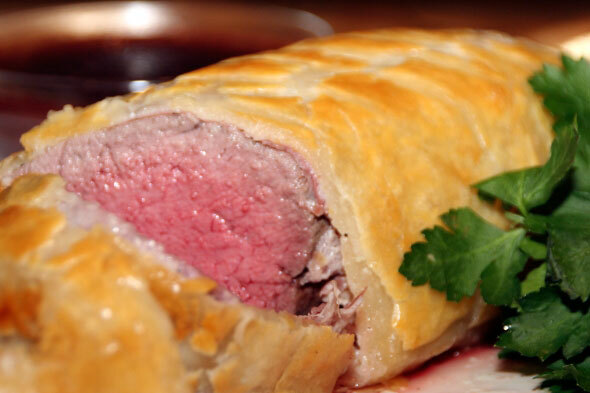 You won’t believe how easy this version of Beef Wellington is to prepare. Puff pastry is simple to work with and less intimidating than it looks. Mascarpone cheese acts as the sticking agent to hold the beef and puff pastry together while creating a mildly creamy flavor to the prosciutto and tender juicy beef. The flavors complete each other with the Port Wine Chocolate Reduction Sauce. I am a fan of dessert wine and was excited to cook with it. The result was better than I expected. In light of the Valentine’s spirit, I whisked in a touch of bittersweet chocolate. Get ready to impress your loved ones with this exquisite masterpiece! This is a fabulous dish to make for any special occasion. The prosciutto and mascarpone cheese make an amazing combination with this tender cut of beef and flaky puff pastry. It gets even better when you dip into the Port Wine Chocolate Reduction sauce. Absolute perfection! Pat beef dry and generously season with sea salt and fresh ground pepper on all sides. Rub beef all over with olive oil. Heat a large skillet on high heat (preferably a lightly oiled cast iron skillet) and lightly coat with oil. When oil begins to simmer place beef on pan and quickly brown on all sides, about 3-4 minutes total. Remove beef from pan and set aside to cool. Carefully unfold puff pastry sheet on a lightly floured large working surface. Gently roll puff pastry out to about 12 x 12 inches flipping over once while rolling. Generously spread mascarpone cheese all over one side of puff pastry sheet. Lay prosciutto slices across the puff pastry to cover entire sheet. Place beef tenderloin in the center, roll up one side, then the other. Fold over ends and trim if necessary. Brush with egg wash. Place the beef on a lightly oiled baking sheet, seam side down and brush the top side with egg wash. (Egg wash should coat entirely) Carefully make 4-5 slits across top using the tip of a paring knife. Bake for 20-25 minutes until pastry is golden brown and thermometer reaches 125 degrees in the center for medium rare. Remove from oven and let it rest, about 10 minutes. While Tenderloin is baking Prepare Port Wine Chocolate Reduction Sauce: Melt butter in a sauce pan over medium-high heat. Add shallots, mushrooms and a pinch of thyme and sauté until softened, about 3-4 minutes. Stir in beef stock and port wine and bring to a boil until reduced to a little less than half, about 15-20 minutes. Reduce heat and whisk in chocolate. Season with freshly ground sea salt and black pepper and simmer until sauce thickens. Remove from heat and set aside. Cut beef into large slices and serve with sauce.